It’s that time of year again, back to school season is here! With back to school comes the return of school buses, school zones, and young kids running here there and everywhere. What does that mean for drivers? It means it’s probably a good idea to refresh your memory when it comes to back to school driving safety, so check out these helpful tips now that back to school season is in full swing. School Buses – School buses are back on the road and it’s always good to have a quick reminder when it comes to the specific laws around school buses. First off, they have red flashing lights and stop signs to alert drivers when they are about to stop. 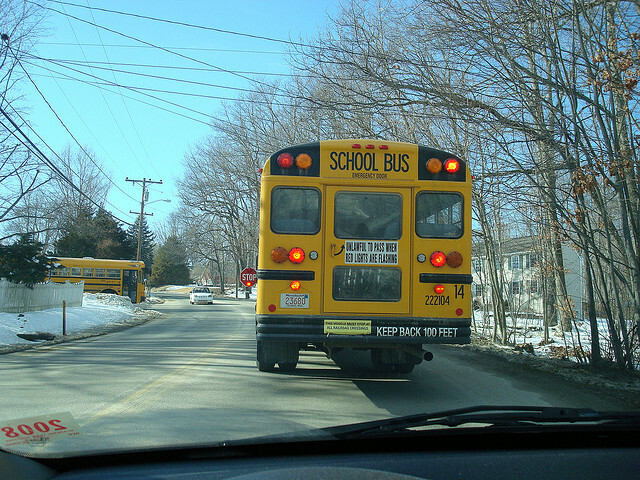 School pupil transport vehicles have red flashing lights and “SCHOOL BUS” signs on top. They use these signals as warnings letting students on and off. If the lights are on and the sign is out, you MUST stop regardless of which side you’re traveling on, it’s the law. The only exception is if a school bus has stopped on the other side of a divided highway with a barrier between travel directions. That is the only time you do not have to stop. If you violate this law, a first offense can get you a $250 fine or even a license suspension. Be sure to go slow even once the stop signs are away and the lights stop flashing, children can often times run out on the street and surprise you, so proceed with caution. School Zones – When it comes to school zones, you should not be going any faster than 20 MPH. Be conscious of children crossing the street, riding bikes, school buses, and crossing guards. Keep your foot above the brake at all times and be prepared for anything, children can be unpredictable and may jump out in front of you when you least expect it, so slow down and stay safe on the road. Crosswalks – When you come to a crosswalk, you must yield to pedestrians as they have the right of way. Look both ways and double check for children in the area. Children may expect to cross at a crosswalk whenever they want, especially if they are young. Some may not look before they cross, so don’t assume that they see you coming. You may think the coast is all clear, but that might be the exact moment a child runs across the street after their toy that rolled into the street. Double and triple check before proceeding with caution near crosswalks, playgrounds, and of course school zones. Distracted Driving – Distracted driving is dangerous enough as it is, and there’s no reason to be on the phone when you’re driving, but if you’re in a school zone or anywhere near an area that kids gather, it becomes even more dangerous because children have been known to unexpectedly dart across the street, so you need to give the road your full attention. If you’re a new driver under the age of 18, any and all cell phone use while driving is against the law. Texting and any internet related activities are illegal for all drivers, although if you are over 18 it is legal to make a phone call while driving, but try to avoid doing so if you’re in a school zone, near a playground, or any other area where children gather. Don’t forget to always check and re-check crosswalks before proceeding, go the speed limit or slower in school zones, avoid distracted driving, and be mindful of the laws associated with school buses. We want drivers and of course pedestrians to stay safe on the roads, so keep these tips in mind this back to school season! Furry Friend Friday With Droid!